Promote your community or business through high-quality video and photos by inviting the department to film your unique, tangible, and engaging events, attractions, experiences, etc. by contacting Industry.Relations@state.nm.us. Show off your own engaging video assets to 120,000 unique visitors each month by linking your YouTube, Vimeo, etc. videos on our interactive New Mexico True video map by clicking here. Have your event or special travel deal considered for inclusion in the NMTD monthly consumer e-newsletter (180,000 opt-in subscribers). Email a 50-word summary along with beautiful images at least six weeks in advance to Digital.Media@state.nm.us. Get in-state or national PR exposure for your uniquely New Mexican, travel-inspiring destination, event or story idea. Check out the NMTD press room for inspiration, then email press releases to Industry.Relations@state.nm.us. Contribute to The Venturesome Traveler blog by authoring your own article or sharing relevant content you’ve already produced. Contact Industry.Relations@state.nm.us. Spread the word about your news, events and initiatives by emailing information, press releases, photos, etc. to Industry.Relations@state.nm.us for consideration on NMTourism.org and in Tourism Talk e-newsletter. Score a spot on our “What’s New” document for national PR pitches by adding Industry.Relations@state.nm.us to your e-newsletter and press release distribution lists. Submit story ideas and “Go, See, Do” events for consideration in New Mexico Magazine by contacting queries@nmmagazine.com. 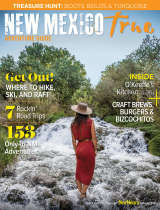 Feature your tourism-oriented business in the New Mexico True Adventure Guide and New Mexico Magazine with a customized advertising package by contacting queries@nmmagazine.com. Highlight your community beautification events, press releases, and positive news stories by emailing our Keep New Mexico True coordinator at clean.beautiful@state.nm.us. Add your tourism-related business listing to newmexico.org. To get started, visit the Partners Portal. If you already have an account, click here. For more information on how to add an event or listing to the website, click here. List your events on the NMTD events calendar at NewMexico.org. To get started, visit the Partners Portal. If you already have an account, click here. For more information on how to add an event or listing to the website, click here. Include your tourism-related deal or discount by listing it at NewMexico.org. To get started, visit the Partners Portal. If you already have an account, click here. For more information on how to add a deal or discount to the website, click here. Incorporate powerful New Mexico True branding into your own marketing efforts by creating your own customized logo lockup and advertising using the Ad Builder Toolkit. Request New Mexico True Adventure Guides and promotional materials for your event, meeting or convention here. Add the New Mexico True Certified mark to your product that is 100% made in, grown in, or born and raised in New Mexico by applying to be in the New Mexico True Certified program. Get involved with the NMTD Regional Marketing Board in your area. Apply to serve on the board or reach out to your region board chair to participate. Upcoming meetings listed here. Show off your tourism experiences by hosting an NMTD True Tour. Tourism department staff will visit your community to learn about the attractions and points of interest that are important to you, and then provide insight and feedback to your tourism stakeholders on how they can work with New Mexico True. Request a True Tour here. Post, share and embed the beautiful New Mexico True videos from your area to promote travel in your community (New Mexico True Adventures, New Mexico True Stories, New Mexico True Television). Access videos here. Apply for a Cooperative Marketing grant to leverage the New Mexico True brand in advertising opportunities. Apply for the NM Clean and Beautiful grant for your cleanup, recycling, and beautification project. Apply for the Rural Pathway Project to receive capacity building training and potential grant funding for your tourism development project. Support your local funding requests with data and resources found in the NM Travel Promotion Toolkit. Watch and learn from industry professionals with archived episodes of the “How To” webinar series. Find out when NMTD will be in your neck of the woods and what initiatives you can attend on the Upcoming Events page. Request a speaker for your upcoming meeting, event or convention to stress the importance of tourism in New Mexico and promote the work you’re doing locally. Take advantage of special partnership opportunities around the department’s marketing and public relations initiatives found here. Utilize the department’s research findings and data to plan and execute marketing activities, garner talking points and make the case for funding. Be in the know! Sign up for our bi-weekly Industry e-newsletter, Tourism Talk, for department updates and partnership opportunities. Explore the many opportunities to work with New Mexico Magazine, including custom publishing, promotion, and advertising packages by accessing the NM Magazine toolkit here.